Canadian Red Cross Emergency First Aid with CPR and AED. A one day course perfect for meeting the basic requirements for (Occupational Health and Safety) OHS regulations. Medical professionals instructing you throughout Alberta at your location or ours. A basic one-day course offering an overview of first aid and cardiopulmonary resuscitation (CPR) skills for the workplace or home. Meets Occupational Health and Safety (OHS) regulations for Basic First Aid. This course is for people who must know the minimum of basic first aid, how to perform CPR, as well as other lifesaving skills, for home or the workplace. Course Content is based on the CPR Level chosen. 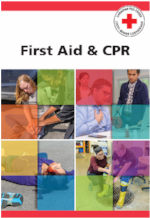 Students must pass a written exam and skills test in order to qualify for an Emergency First Aid/CPR certification card.